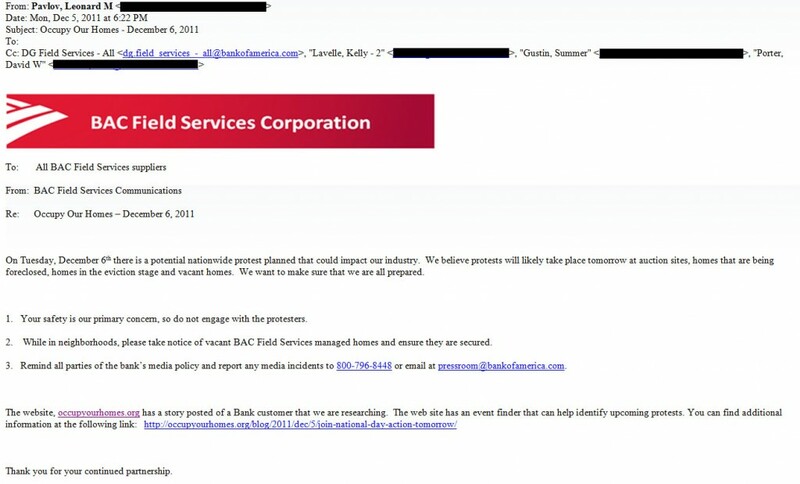 Here’s an email sent out yesterday by Bank of America regarding today’s “Occupy Our Homes” day of protest. Full text below. For context, Matt Taibbi on foreclosure fraud here. Your safety is our primary concern, so do not engage with the protesters. While in neighborhoods, please take notice of vacant BAC Field Services managed homes and ensure they are secured. Perhaps this latest action by OWS will satisfy those who insist that the movement has no aims, policy or program. We’ll be providing a further update on Occupy activity shortly. This entry was posted in Current Events on December 6, 2011 by Michael Happy.